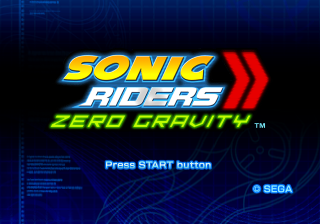 Sonic Riders: Zero Gravity, known as Sonic Riders: Shooting Star Story (ソニックライダーズ シューティングスターストーリー) in Japan, is a racing game for the Wii and PlayStation 2 consoles, and is the sequel to Sonic Riders. Like the previous game, this game differs from traditional racers (such as Sonic R) in its use of air-based travel with features such as "turbulence" affecting gameplay; However, this entry substitutes the use of air gimmicks for the use of new gravity-focused powers. The sequel adds new abilities to most of the characters. There are also new racers, hover boards, bikes, air riders, yachts, air skates and other futuristic hover crafts available. Gathering rings during races will allow you to upgrade your current gear in real-time, up to a total of three times per race. Three new gameplay modes have also been added. The story begins when four shooting stars crash into the planet, one crashes into the Crimson Tower and rolls into the back of a MeteorTech robot. It wakes up, along with others and go on a rampage. The next day, Team Sonic are on their way to Megalo Station when they hear about the news on the radio. Soon, they are attacked by the robots, who seem to have recognized the meteor Sonic is holding from last night, and barely escape with their lives. Fortunately, the Ark of the Cosmos' was able to save Sonic, and they all escape from the city. Along the way, Team Sonic meet up with Amy, who says she was being pursued by the robots, as well. As she hugged Sonic, she drops an Ark of the Cosmos. Tails then realizes that the robots are after the meteorites. They decide to go to MeteorTech to solve this mystery. The team then arrives at MeteorTech and is greeted by the Babylon Rogues. Jet tries to force Amy to hand over the Ark but is clueless as what Jet is talking about. An alarm then sounds alerting the robots. Sonic and friends take off leaving the Rogues in pursuit. Sonic and Jet unknowingly crash into Eggman in the main computer room of MeteorTech. When he gets up and reveals himself, Sonic and Knuckles threaten Eggman and reveal his plan for forming MeteorTech. When he sees Sonic's Ark of the Cosmos, Eggman reveals that his Mother Computer hasn't been responding ever since he gave it an Ark. Jet remembers what he was there for but sees that Amy and Storm are missing. Eggman's computer shows that Storm is chasing Amy but they are being followed by a MeteorTech robot. Sonic, Tails, and Knuckles leave and find Amy in the Aquatic Capital. She informs them that the robot self-destructed and Storm ran off with something it dropped. She said that Storm was going on about something he found in a place called Giga or something. Knuckles then confirmed it to be the Gigan Rocks. The team arrives at the rocks and find the treasure gone. When Knuckles reads an ancient script, they find that Babylon Garden is a spaceship powered by the Arks of the Cosmos and that a great darkness assaulted it. Eggman then flies over with The Babylon Rogues' airship in pursuit. Sonic then says that they should catch up. They arrive at MeteorTech's home tower and find Jet and the Rogues waiting. Wave confirms that Crimson Tower is MeteorTech's signal tower. Storm then says that the Arks they collected were stolen by Eggman. Jet challenges Sonic with the prize being the Arks of the Cosmos and Title of Fastest Creature in the Universe to whoever nabs Eggman first. When they reach the top, Sonic and Jet enter at the same time and grab one of the two Arks he was holding. After bumping into his machine, Wave grabs the master Ark that fell out. After this, all robot operations were shut down. Due to the five Arks being in the same place at once, it called down Babylon Garden. Seeing that he doesn't need the Arks of the Cosmos, Sonic hands all of them over to Jet. When Jet accuses Sonic of running away, Sonic states that he'll see Jet at the next World Grand Prix. The story begins in The Gigan Rocks when the Babylon Rogues are trying to get an Ark of the Cosmos at the Chalice. The Ark was a booby trap, so Jet punched in some keys on an ancient keyboard in Babylonian text. This deactivated the trap. Slowly, Jet grabbed the Ark of the Cosmos. No sooner than that, Wave saw a shooting star. There, she closed her eyes and put her hands together, making a wish. When she tells Storm what she's doing, he simply laughed, but not for long, as he saw Jet doing the same thing. Jet wished of having a power to beat him. Then, three more crashed down and caused a rumbling sound just as Storm was about to make a wish himself. This re-activated the trap, causing two boulders to come crashing down. It nearly crushed them until the Ark's power caused them to fly. Jet's wish already came true. With this power, the Rogues escaped the ruin safely. Back on the ship, Wave was analyzing the Ark of the Cosmos they found and explained it can charge up gravity and convert it to power the engine unit of Babylon Garden. She explains that there are five of them. Jet then orders her to create a radar to help find them. But before she could do that, Storm bursts in and shows a news report of a MeteorTech Mech stealing an Ark of the Cosmos from the Megalo City Museum. At seeing this, they set a course for Megalo City. After going through Megalo City, Jet tracks the robot to the Botanical Kingdom where he destroys the robot, but loses the Ark. He searches the ground and discovers Sonic talking with the others. When Amy hugs Sonic, the Ark of the Cosmos she found (the one Jet is after) falls out. Overhearing their conversation about MeteorTech, Wave and Storm appear and Wave suggests that they go ahead of Sonic and the others to gather information on MeteorTech. They meet Sonic and friends at MeteorTech but are cut short by guard robots. As Sonic, Tails, Knuckles, Jet, and Wave ride off, Storm attempts to get the Ark of the Cosmos from Amy. She then escapes with Storm in pursuit. They reach the Aquatic Capital and Amy throws the Ark at Storm's face. She then insists that he find away out when they are confronted by MeteorTech Robot SCR-HD. After scanning Storm's Ark of the Cosmos, it blows up and reveals a second Ark. Storm runs off with both Arks and returns to the airship. Jet, happy that they now have three, is cut off by Wave's description of an ancient Babylonian text. After Jet gives up on trying to figure out what the 'lightless black' is, he find that the two Arks are missing. Eggman then appears outside flying away with them. They follow Eggman to the Crimson Tower where they wait for Sonic and the others. Jet then challenges Sonic and they reach the top of the tower. After Babylon Garden is called down, a damaged SCR-HD breaks in and steals all five Arks of the Cosmos from Wave. Tails informs Sonic that the five Arks will make a giant black hole if put in Babylon Garden. After that, Eggman declares that massive energy readings are coming from Babylon Garden. A scene then shows the outer part of Babylon Garden falling off transforming it into Astral Babylon, the Babylonian spaceship and creating a black hole. Sonic, Jet, and everyone (Except Eggman and Amy) rush to Astral Babylon's Mobius Strip to face SCR-HD's giant new form and disconnect the Arks of the Cosmos from the ship. Afterward, it shows Astral Babylon orbiting Earth. Jet and the Rogues are atop a rock in the desert looking at it. After a quick conversation they fly off on their gear. The scene then switches to Sonic, Tails, Knuckles, and Amy, in Tails' car driving through Megalo City. Tails explains how the ancient Babylonians warped to Earth and left their engine unit in orbit. Shortly after, Sonic hears someone say his name in the tunnel. Jet rides up imposing a challenge. The scene ends with Sonic and Jet racing through the tunnel marking the end of the story. In addition to the game's story mode, each level includes seven "missions", where characters must race through the area fulfilling certain criteria, like collecting rings or grinding along a specified number of rails - somewhat similar to the mission mode in the original Sonic Riders. From a storyline perspective, these Extreme Gear outings are not "real"; the entire mission mode represents a series of simulations being conducted by Eggman and his new "Sonic Simulator", in a bid to study his enemies' techniques. Rouge, Shadow, Cream, Blaze, Silver, Super Sonic, Amigo, NiGHTS, and Billy Hatcher do not take part in the story mode. Most of the characters that are unlockable in the game (excluding Billy Hatcher, Amigo, Blaze, Silver, and the MeteorTech robots) were unlockable in the original Sonic Riders. The US PlayStation 2 version along with all regional variations of the Wii version have both voice language tracks included in the game disc and features an option to switch between both English and Japanese voice language. The EU PlayStation 2 version, on the other hand, only features the English voice language in the disc and therefore lacks the voice language option completely. The text language is entirely multilingual and manually selectable in all the regional variations of both versions. This page was last edited on 2 April 2019, at 10:41.